I love pickling and preserving ingredients. It reminds me of my grandma and of childhood. I think about the produce and where it came from, especially if it is home grown or donated by a generous friend and feel a real sense of connection to the end result. As I dry the mason jar and chop up the ingredients, I start praying to the pickle gods to look after my little creation, to ensure they don’t catch a fungus and that they get enough warmth and light. Every week I rotate the jar, and peek through the sides hoping that the pickle will come along nicely. I wait for weeks and weeks (im)patiently waiting for the magic to happen, when the vegetables or fruit turn glossy and sticky. When I finally open the jar, and everything has set just right, the spicy, tangy smell hits and all I can think about is a huge scoop of home made pickle with a side of plain rice. 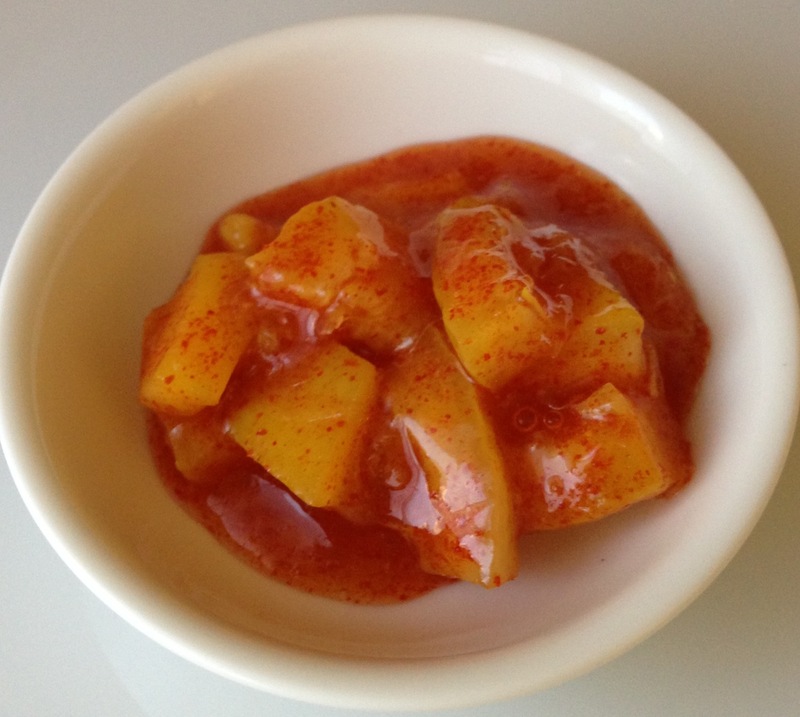 This Sweet Chilli Lemon pickle is Mangy’s mom’s recipe. I think of it as a breakfast pickle. It goes beautifully with hot parathas and is spicy and sweet enough for a morning meal although Mangy has it 5 times a day (including tea time). We were lucky this year to have 3 kilos of lemons from our backyard, so this pickle is extra special. Juice 2 large lemons. Cut the lemons (including the rind of lemons that you juiced) into small pieces, remove any pips. Place the lemons in a large bowl. Add turmeric powder and enough salt to coat all the lemon pieces. Add lemon juice and stir well. Place this mixture in a large sterilised pickling jar. Set the jar in a dry area of the house for about a week. Open the jar, give it a good stir and add another 1/2 cup of salt. Set aside again for another 5 to 7 weeks. Every week, rotate the jar and just have a quick look to make sure there is no fungus. The yellow in the lemons will start to darken and that’s when you know they’re breaking down nicely. After 6 to 8 weeks, open the jar and check the lemons. They should be soft and the lemony smell should be really strong. If there is fungus on top, carefully scoop this layer out and discard. Pour the lemon mixture into a large bowl, add sugar and red chilli powder and stir well. Pour this back into the jar and set aside overnight. The pickle is ready for consumption the very next day and will taste better with age. I suggest transferring a small quantity to another container for everyday use. You don’t want to open the main jar too many times. Also, don’t be tempted to use icing sugar. Icing sugar usually has cornstarch, so buy regular sugar and blend into a powder in your mixie or food processor. Enjoy!